The body is a fascinating thing. It’s a really intricate vessel with a ton of moving parts—more than many machines. But at the same time, it can do odd things. Sometimes things show up in your body or skin for what appears to be no reason. Unfortunately, a lipoma is one of those mysteries. They can appear out of nowhere, but why? That’s what we’re here to answer. 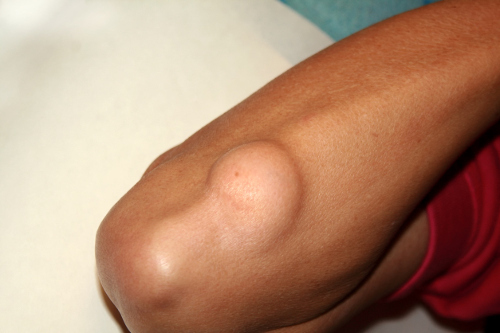 We’re going to take a look at everything lipoma, from lipoma symptoms to lipoma treatment. We’ll also discuss what to expect during a lipoma diagnosis, so when you go to the doctor, there won’t be much in the way of surprises. Some of you may have the question, “What is a lipoma?” Well, it is a growth of fat cells in a thin, fibrous capsule. They are usually found on the torso, upper arms, armpit, upper thighs, and neck. They tend to occur just below the skin. For many people, the first thought concerning any type of growth is that it’s cancer. Don’t be worried as lipomas are noncancerous and relatively physically harmless, but may cause social anxiety in some sufferers depending one where it appears on the body. They occur in both men and women at comparatively equal rates. And while they may occur at any age, they will tend to appear on middle-aged adults. It is not unusual to see multiple lipomas form at once, but men tend to get multiple lipomas more than women. With these in mind, what should you look for when trying to identify a lipoma? We’re glad you asked. The good thing about a lipoma is that it is relatively benign. They do not bring on any symptoms of illness, nor do they lead to any devastating diseases. So, how will you know that your lump is a lipoma? Are there recognizable traits? As we previously mentioned, a lipoma is a growth of fat cells, so they tend to be soft. Because they are soft, they can also be moved. You can sort of shift them around a little with your finger. They are colorless and are usually range in size from one centimeter to three centimeters. While a lipoma appears with an initial growth, they may not grow beyond that, or years later (if the lipoma is left untreated) it may experience a growth spurt later. The lipoma may also grow very slowly. Lipoma will almost always be painless, unless they happen to form under or very close to a nerve. At this point, the lipoma may rub against the nerve, causing pain in that spot and possibly radiating outward. Given its slow growth and lack of discomfort, how do doctors go about diagnosing lipoma? Are there certain risk factors that lead to lipoma more than others? There are, and here’s what you need to know. With these in mind, the best way to be sure that it is a lipoma is to go to a doctor for a full diagnosis. Diagnosing a lipoma follows the same process that a number of other medical issues will have, especially since it’s a growth. A good amount of care will be taken with your lipoma. The doctor will talk to you regarding your medical history. This is in order to quickly rule out or rule in other medical conditions that may create similar growths to a lipoma. The doctor should take particular notice to how the growth appears, and will test you to make sure there’s no pain or real discomfort. At this point, if the doctor still isn’t sure what the growth is, they may have it removed and tested just to be sure. The best that will happen is that your growth comes back as a lipoma and everything goes back to normal. The worst thing that could happen is that it’s not lipoma and you have caught whatever it was relatively quick. Once a diagnosis has been made, you can begin with the treatment of your lipoma. With everything that we’ve discussed, you’re probably wondering how lipoma can be treated. In essence, there are three basic plans of treatment when it comes to lipoma. The most commonly used treatment for a lipoma is surgery. The lipoma is cut out of your body with a cut or two and removed. A majority of the time, this ends in permanent removal of the growth. Injections of certain steroids are also used on a lipoma as a way to shrink the lipoma. The one issue with this treatment is that it will only shrink the lipoma; it will not get rid of it completely. Liposuction can also be used to reduce the size of the lipoma, as all of the fat it contains will be sucked out via a syringe. As with injections, this method will substantially reduce the size; however, it may not rid you of the lump entirely. Once you have the lipoma diagnosed, you’re pretty much in the clear. There are a few options for treatments to get rid of the lipoma, but if the lipoma isn’t bothering you at all, you may not even bother to get it removed. At the very least, you can wait until a more convenient time to schedule treatment. Regardless, don’t trust in self-diagnosis alone when it comes to any small lump or growth on your body. Always get checked out by a doctor first. Cassata, C., “What Is a Lipoma?” Everyday Health; http://www.everydayhealth.com/lipoma/guide/, last accessed June 27, 2016.